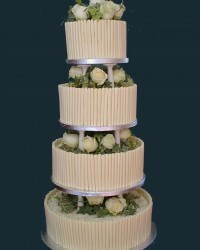 A sophisticated cake for an elegant venue or rambling and natural for a country wedding. Delicate curls of white Belgian chocolate surround a rich moist chocolate cake, layered with a fresh milk chocolate buttercream and decorated with a simple display of ivory roses and ivy. 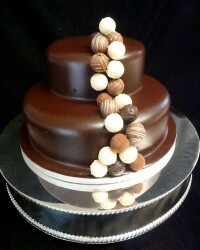 Our signature Truffles cake, but in delicious white Belgian chocolate. Rich chocolate cake with light buttercream, covered in a smooth chocolate glaze. 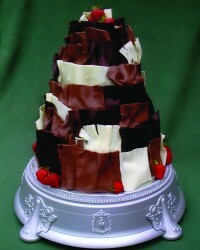 The cake is decorated with a selection of truffles and shards of broken chocolate and displayed on a fabric covered stand. 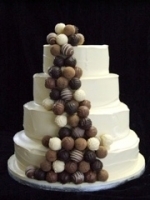 The two tier version of our popular Truffles wedding cake. Rich chocolate cake with a chocolate glaze and a cascade of Belgian truffles. 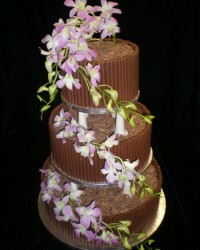 Rich chocolate wedding cake with milk chocolate curls and a deep layer of light flakes of milk chocolate on top. Each tier is supported on pillars and sprays of fresh orchids trail between the tiers. 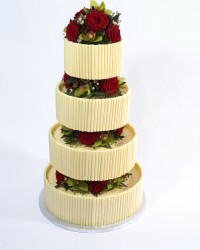 ~£600 including flowers and tiers. 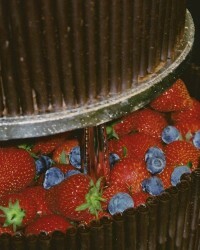 Seasonal Berries makes a great choice as a dessert served with additional fruit or a fruit coulis, with a curl of chocolate served with each slice. 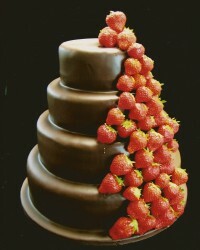 Rich dark chocolate cake, or a light and zesty lemon cake with curls of Belgian chocolate and fresh seasonal berries. 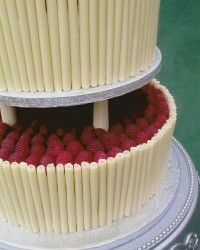 A breath-taking stunner, based on a traditional design, with crisp curls of white chocolate. The tiers appear to be floating on red roses and green orchids. The flowers can of course be substituted for another type or colour. 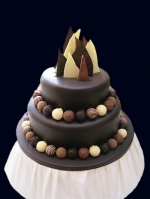 This dramatic looking cake has Ruffles of Belgian chocolate encasing the soft sponge cake. These ruffles are a mixture of milk, dark & white chocolate.